There are two prominent travel seasons in the Philippines. First is during the time when the Catholic majority of the Philippines commemorate the Holy Week which happens sometime between mid-March to mid-April depending on the Roman Catholic calendar and secondly during first week of November in observance of another event from the same religion. Aside from professing their faith, most of these dates are non-working holidays which gives an ample time for the country's busy workforce to travel longer distances. Here is a one-stop, comprehensive guide to help Philippine travelers on their adventure trips on having a stress-free wandering vacation. A map is a very valuable resource for any traveler and road-tripper. Aside from using the map to plan your trips ahead, you may use it as well to make sure that you are en-route to the places you need to be. During this digital age, maps no longer need to be in paper as applications are available for most smartphones. The only difference is if it is offline or online. Online maps require that you must always be connected to the internet while the latter can be accessed even without connection because the mapping data is already saved into your devices' memory. GPS is essential to ensure that you know your current location in the map and does not require any data plans as you use the GPS satellites that tells your exact location over a map. Routable maps are an extra as these maps do not only tell you your exact location with the help of the GPS but also tells you where you need to go... hence, getting lost is one of the least of the issues you could have. Although most smartphones are already equipped with GPS receivers, a dedicated GPS device is more beneficial as it is more reliable and does not consume much power as compared to a smartphone. It can be used up to 20 hours non-stop on some devices as compared to a smartphone that discharges faster when GPS and the screen is turned on to prolonged periods. Schadow1 Expeditions provides a frequently updated and highly street-level accurate GPS routable map of the Philippines based on contributions made by Openstreetmap Philippines mapping advocates and also from our contributions while we map and travel the Philippines. Download it up at our #mapPHL page. If you do not have a dedicated GPS device and have a smartphone, specifically an Android phone with GPS capabilities, you can download OSMAnd or Map Factor Navigator for free and download the Philippines map. The map in the mentioned applications is based from the same mapping data that Schadow1 Expeditions contribute to, minus some of the local features that is available from the map we compile at our #mapPHL page. But still usable as compared from other maps. 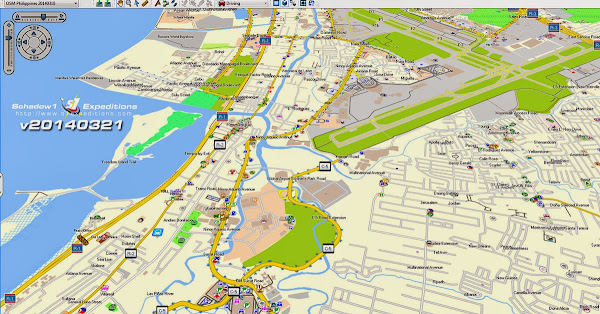 We have also created a review of some of the digital maps available for the Philippines here. Road tripping? Aside from having your own GPS-guided routable maps of the Philippines, in case of emergencies, you should be able to know who to call. The following are the hotlines of major tollways in Luzon. 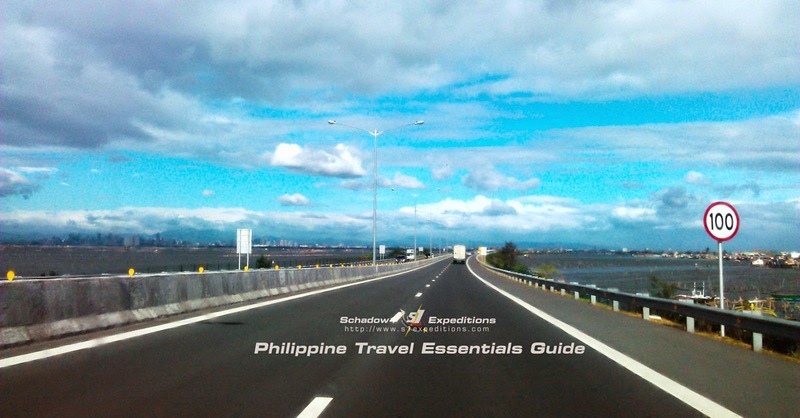 The highway link from Manila to the southern provinces of Laguna and Batangas. Starts at Skyway with hotline +63 (917) 5398762, +63 (999) 8880893, +63 (932) 8546980. (3) Bringing your own Car? Remember the acronym BLOWBAG. Always check the Brakes, Lights, Oil, Water, Battery, Air and Gasoline before going on a long drive. And bring your own back-up water in case of over heating and do not forget your tools and early warning device (EWD). Having your routable map is also beneficial so you would know the nearest gasoline station, vehicle service areas, and nearest convenience stores when you need it. Driving at Donsol using a GPS navigation device equipped with the GPS routable map of the Philippines based on OSM data. And when driving, polarized sunglasses help you on extreme glare of the sun and provide good contrast while driving. Always note the bus number or the ship you will be taking and SMS it to your family before riding. This would help them know where to look for you in case of emergencies. And don't forget to sign the manifest. (5) Bring your own water bottle. Instead of buying drinking water in PET bottles that pollutes the environment, bring your own water container. (6) Going to the beach? Bring your sunblocks with rating of SPF40 and bring a vinegar as a first aid for jellyfish stings. Always wear life vest if riding boats. 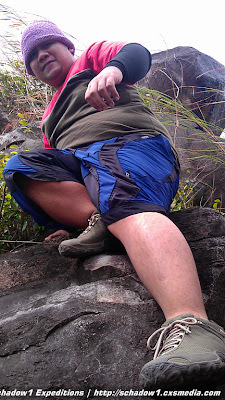 Use trekking shoes and bring first aid kits and water supply. If trekking a blood leech infested trail, make sure that you dress up fully covered (trekking pants) and bring foods high in carbohydrates such as chocolate bars, jelly candies and bread. GPS routable maps come in handy especially if the mountain you are climbing has already been mapped to ensure you are on the right trail. Download the latest Elevation Contour Map of the Philippines to guide you on the topography of the mountain you are exploring especially in the absence of mapped trails. Download the map on our #mapPHL page. Hiring a local guide will also help to mountains unfamiliar to you. Ensure that you bring along extra batteries for your devices or a power bank. If charging them in a hotel, make sure that you have brought in your chargers, socket converters and power plug splitter receptacles so you can charge more devices at the same time in case there are only a limited number of power sockets in the room. Take note that the Philippines run in 220V. Most important tip: Ensure that someone you know who is not part of the trip knows where you are going. Check this article out on how to do it effectively: Tracking your travels. Let us rediscover the Philippines, explore and travel to places you have never been so you would not be a stranger to our own motherland. Do you have any other travel tips? Let us know by placing in your comments below. 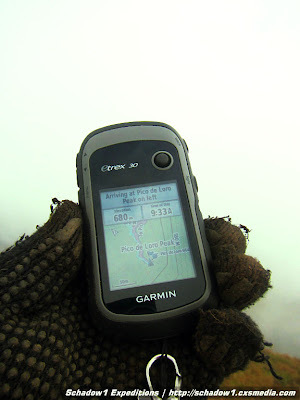 Now I've realized how important GPS...specially to backpackers and solo travellers. Great tips here bro! Thanks Jeffrey. Glad it helped!